The college basketball regular season is headed into its homestretch, and that means it's time for the sport's best rivalries -- Duke-UNC, Michigan-Michigan St., Kentucky-Tennessee. Caesars Entertainment has preemptively posted odds for a handful of them. The college basketball regular season is headed into its homestretch, and that means it's time for the sport's best rivalries -- Duke-North Carolina, Michigan-Michigan St., Kentucky-Tennessee, etc. Caesars Entertainment has preemptively posted odds for a handful of them. ## College basketball rivalry game odds <a href="https://twitter.com/lindetrain/status/1093258883534020608?ref_src=twsrc%5Egoogle%7Ctwcamp%5Eserp%7Ctwgr%5Etweet" class="embedly-card" data-card-width="100%" data-card-controls="0">Embedded content: https://twitter.com/lindetrain/status/1093258883534020608?ref_src=twsrc%5Egoogle%7Ctwcamp%5Eserp%7Ctwgr%5Etweet</a> The appeal of betting these games now is that you could be getting a great price when the matchups roll around. 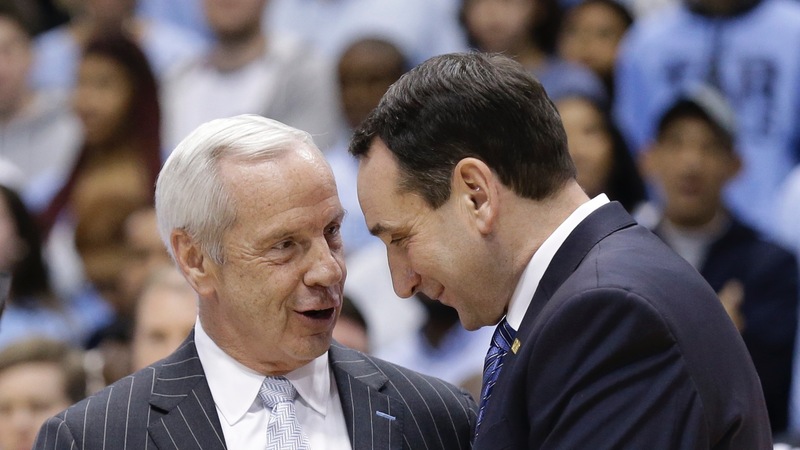 If North Carolina upsets Duke on Feb. 20 at Cameron Indoor, or even keeps it close, the Heels would likely be favored at least by a couple for the regular-season finale at the Dean Dome. Or you could be getting a good price right now on a team like Michigan State, which has lost three straight (including the last two as a big favorite) but [hasn't seen its title odds lengthen](https://www.betchicago.com/michigan-states-ncaa-tournament-odds-2019-losing-streak). __MORE:__ [Boston College bettors dealt bad beat at Duke](https://www.betchicago.com/college-basketball-betting-notebook-illini-beat-michigan-st-as-big-underdogs) | [Buy or sell Iowa State at 40/1](https://www.betchicago.com/ncaa-tournament-2019-odds-ap-top-25-rankings-buy-sell-iowa-state) The 10 games feature the top-9 teams in the country, plus St. Mary's (Gonzaga's biggest WCC rival) and Utah St. (Nevada's biggest Mountain West rival). They also showcase some of the top teams against the spread, as No. 3 Virginia (16-5 ATS) is tied with Ole Miss for the fifth-best record ATS in the country. No. 8 UNC (14-5-3 ATS) is eighth, No. 4 Gonzaga and No. 9 Michigan State (both 16-7 ATS) are tied for 16th and St. Mary's (15-8 ATS) is 27th. North Carolina has won the last two ACC regular-season championships, and the Heels, Blue Devils and Cavaliers are currently tied atop the league at 8-1 (Virginia lost to Duke, and Duke lost to Syracuse, while Caroina got crushed at home by Louisville last month). Gonzaga, which has won five of the last six WCC regular-season titles (and tied for the other), has beaten St. Mary's 13 of the last 16 times they've played, and all but one of the Gaels' losses in that stretch have been by at least 10 points (for those intrigued by the 9.5-point line above). St. Mary's isn't even in second place in the WCC. The Gaels are tied with San Francisco at 5-3, a half-game behind BYU (6-3). Kentucky historically has a massive advantage on Tennessee, but the Vols have won three of the five meetings between the teams the last two seasons, including a 61-59 victory last season in Lexington. No. 6 Nevada (13-7-1 ATS) is only listed as a 1-point favorite for March 2 at Utah State despite beating the Aggies [by 23 points at home last month](http://www.espn.com/mens-college-basketball/game?gameId=401089695). __PLAY:__ Our free [College Hoops 3-Pointer](https://betchicago.chalkline.com/games/college-hoops-pick-3-spreads-totals). Correctly pick three games against the spread and their totals to win a BetChicago prize pack.